I have four 1960 Nu-Card Baseball Hi-Lites cards in my collection. They are about the size of postcards and a decent card stock. I actually did a post about these back in 2009 (link at bottom of this post) which was then cross-posted to "Things Done With Cards." So, if I already talked about these back in 2009, why bring them back out? Well, in this post, I wanted to show all the cards I have in this set. In the other posts, I just showed off one or two. 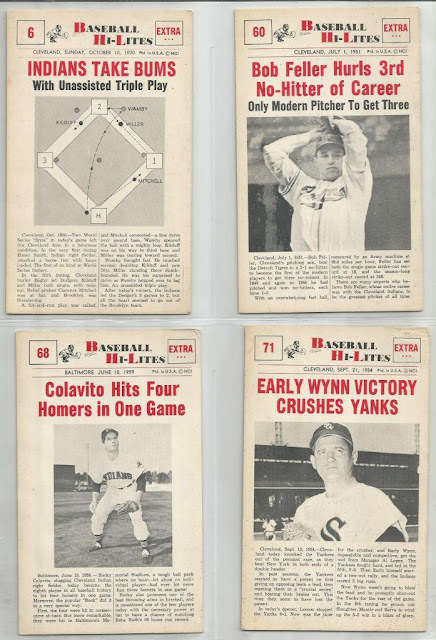 As you can see, I have "Indians Take Bums," "Bob Feller Hurls 3rd No-Hitter of Career," "Colavito Hits Four Homers in One Game," and "Early Wynn Victory Crushes Yanks." Here we have another example of non-Indians cards in my collection. The Early Wynn actually comes from his days with the Sox. So, why is it in my collection? To the best of my recollection, I bought the cards off eBay as a set and I believe they were sold as an Indians set. Honestly, until I scanned them in here for this post, I didn't even realize that Wynn wasn't in a Tribe uniform! Shows how observant I am, eh. I did not show the backs of the cards in the other post. 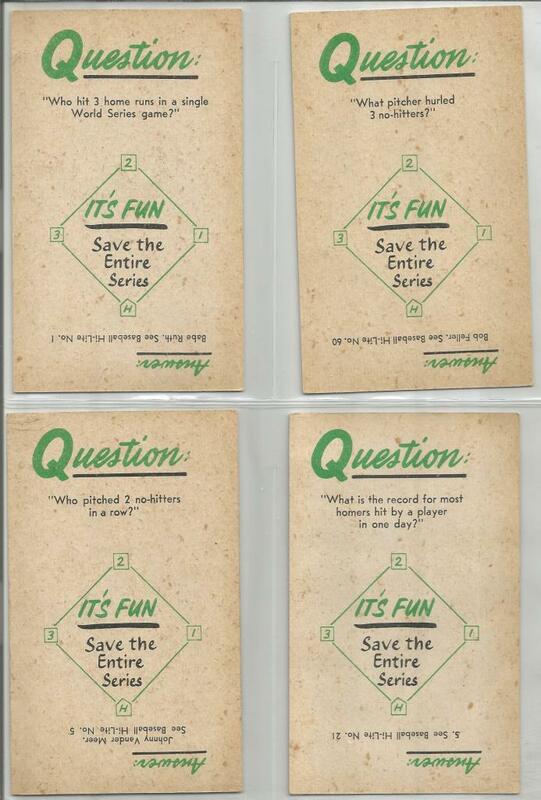 The backs feature a trivia question witht he answer printed upside down. These have always been among my favorite oddball sets - it's nice to see them again!